The Defense Intelligence Agency (DIA) has released China Military Power, a product that examines the core capabilities of China’s military. 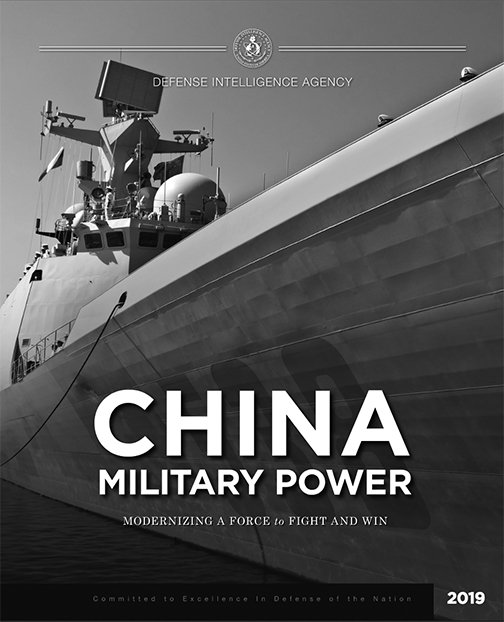 This volume in DIA’s series of Military Power reports provides details on China’s defense and military goals, strategy, plans, and intentions. It examines the organization, structure and capability of the military supporting those goals, as well as the enabling infrastructure and industrial base. Since Mao Zedong’s Communist Revolution in October 1949 brought the Chinese Communist Party to power, China has struggled to identify and align itself with its desired place in the world. Early factional struggles for control of party leadership, decades of negotiations to define territorial boundaries, and continued claims to territories not yet recovered have at times seemed at odds with the self-described nature of the Chinese as peace-loving and oriented only toward their own defense. Chinese leaders historically have been willing to use military force against threats to their regime, whether foreign or domestic, at times preemptively. Lack of significant involvement in military operations during the last several decades has led to a sense of insecurity within the People's Liberation Army as it seeks to modernize into a great power military. The Military Power series of unclassified overviews is designed to help the public achieve a deeper understanding of key challenges and threats to U.S. national security and focuses on U.S. near-peer competitors and challengers such as Iran, North Korea and terrorism. DIA has a long history of producing comprehensive and authoritative defense intelligence overviews. In 1981, DIA published the first unclassified Soviet Military Power report, which was translated into eight languages and distributed around the world. Two years ago, in the spirit of Soviet Military Power, DIA decided to once again produce and publish unclassified defense intelligence overviews of the major foreign military challenges we face. DIA published the first in the new series, Russia Military Power, in June of 2017. Lieutenant General Robert P. Ashley, Jr., DIA director commented that this report offers insights into the modernization of Chinese military power as it reforms from a defensive, inflexible ground-based force charged with domestic and peripheral security responsibilities to a joint, highly agile, expeditionary, and power-projecting arm of Chinese foreign policy that engages in military diplomacy and operations across the globe As China continues to grow in strength and confidence, the U.S.' nation's leaders will face a China insistent on having a greater voice in global interactions, which at times may be antithetical to U.S. interests. With a deeper understanding of the military might behind China's economic and diplomatic efforts, we can provide our own national political, economic, and military leaders the widest range of options for choosing when to counter, when to encourage, and when to join with China in actions around the world. This product and other reports in this series are intended to inform the public and the nation's leaders, the national security community as well as partner nations about the challenges our nation faces in the 21st century.